One of my favorite ways to officially end the holiday season is with a French Three Kings cake, otherwise known as a galette des rois. The delicate treat consists of almond cream slathered between two layers of flaky pastry. 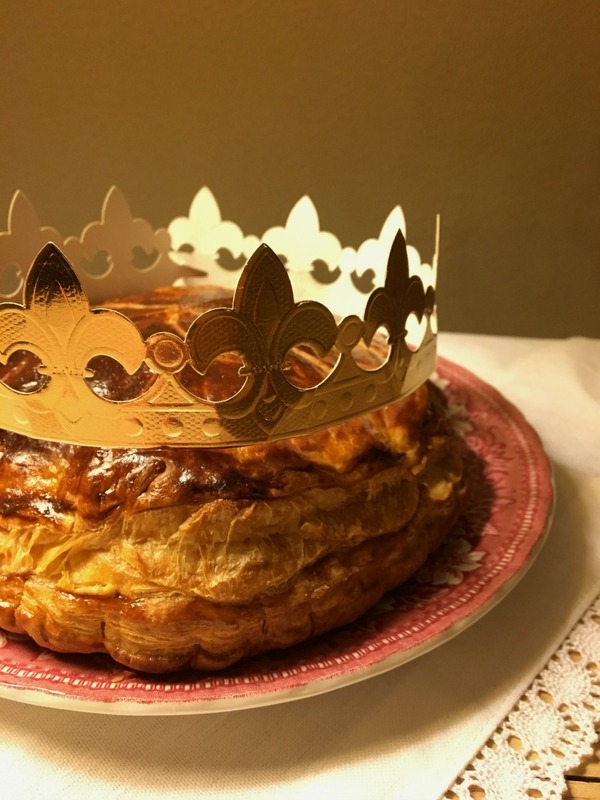 It is eaten to celebrate the Feast of the Epiphany on January 6th, though it is available at French bakeries throughout the entire month. Usually, a figurine (fève) is hidden inside the cake. Tradition says that the youngest person in the household gets under the table and says who gets which piece. The person who finds the figurine is crowned king or queen for the day. I am happy to say that this year I was crowned queen! And no, I didn’t cheat! In the past, I always purchased my galette des rois from one of my favorite French bakers here in the Netherlands, Le Fournil de Sébastien, but this year I decided it was time to make my own. And it couldn’t be easier! Line a baking sheet with baking paper. Cream the butter and the sugar using a standing or hand-held mixer. Beat in the eggs one by one. Beat in the almond flour and almond extract. Place one of the pastry circles on the baking sheet and spread the almond cream over the surface, leaving a free edge. Don’t forget to place the figurine on the almond cream. Brush the whisked egg along the edge and cover with the second pastry circle. Seal the edges well with your fingers and then crimp. Brush the galette with beaten egg and place in the fridge for one hour. Preheat the oven to 200C. Remove the galette from the fridge, brush with egg again and carve a nice pattern on the pastry using the back of a knife. Make a few air holes in the pastry. Bake the galette for approximately 20 minutes. Reduce the heat to 180C and give the galette an extra 20-25 minutes. Check after about half an hour to see if the galette is not browning too much and cover with foil if necessary. Whisk the jam and water and heat. Brush the cooled galette with the jam. Delicious with a glass of Champagne! Oftentimes I hear comments about how difficult the French kitchen is. All those techniques. All that precision. French cooking, and especially French baking, is for the real pros. In other words, French chefs and bakers. So, if we want authentic French taste, our safest bet is to head to a French restaurant or bakery. French cooking is only as complicated as we want it to be. Of course, there’s an element of know-how involved, but there’s also an element of passion, and perhaps even more important, an element of simplicity. When creating some of the more ‘difficult’ French recipes, I make sure to include all three factors. Take Canelés de Bordeaux. I can’t tell you how many disasters I’ve seen. These little tartelettes are surprisingly easy to make and are a wonderful dessert or afternoon treat. Don’t forget to check out how to make them on my YouTube channel (and please subscribe!). Mix flour with butter, salt and sugar in processor at low speed for about 20 seconds or until mixture resembles coarse breadcrumbs. Add the whisked egg and pulse until dough comes together into a ball. If the dough seems dry, add a drop or two of iced water. Shape the dough into a disk and refrigerate 40 minutes wrapped in cling film. Let it sit at room temperature for 5-10 minutes before using it. Preheat the oven to 200°C. Roll the dough out to a thickness of about 3mm. Place the tartelettes moulds upside down on the dough and cut a circle around them, slightly bigger than their actual circumference. Grease the moulds with butter and dust them with flour, shaking off any excess. Press the dough into the moulds and prick their surface with a fork. Divide the apple blocks over the moulds and bake them in the oven for 15 minutes. In the meantime, whisk the cream, egg, sugar and vanilla extract in a bowl. 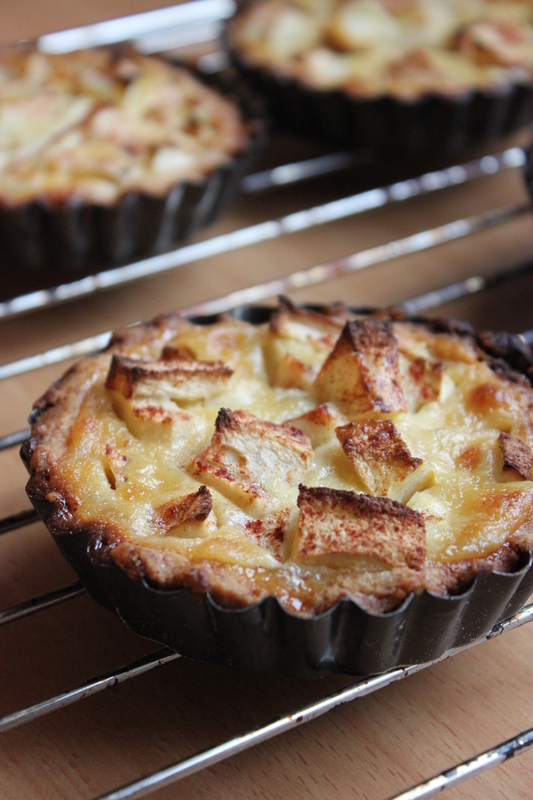 Take the tartelettes out of the oven and pour the custard over the apples. Return to the oven and bake for an additional 15 minutes. Leave to cool on a wire rack before unmoulding. 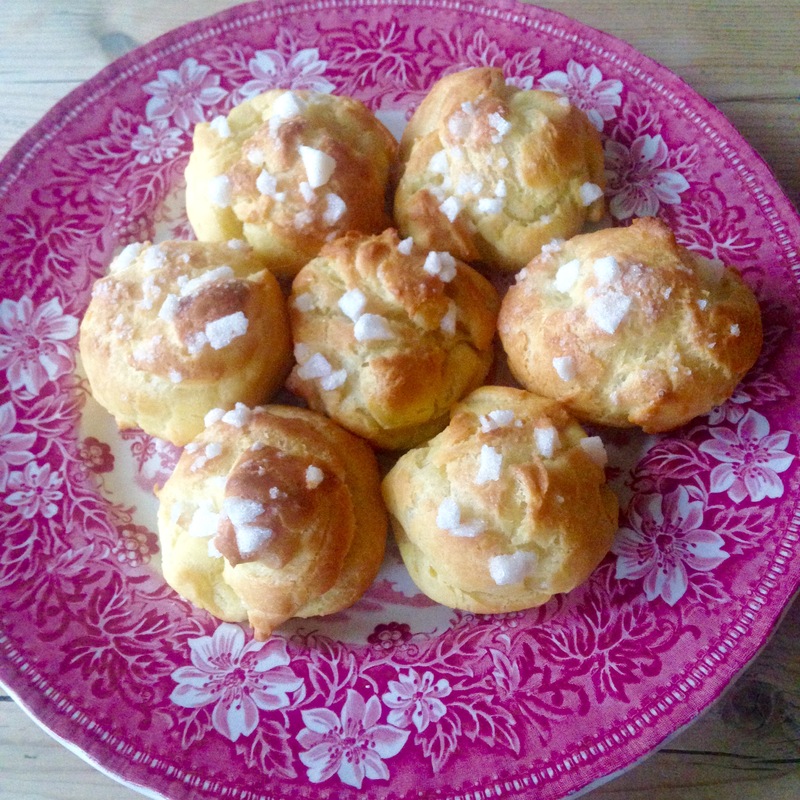 Serve with cinnamon ice cream or a light dusting of icing sugar.